A rock formation in which the top part protrudes forward horizontally to hang over the vertical parts of the rock face. 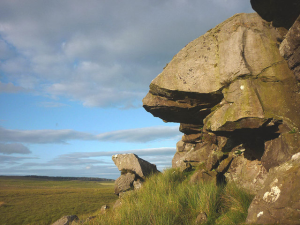 "Overhang on Swallow Crags, Northumberland, Great Britain, August 3, 2015" by Karl and Ali is licensed under CC BY-SA. 2015 3 Types of Rock Faces for Climbing. About Sports.